One hour into the journey, thirty-three to go. ‘Plenty of time to catch up on sleep,’ suggests our Tibetan guide as we clutch the auspicious scarves he has brought to welcome us. It had been an early start in Xian and now ‘soft’ couchettes beckon but travelling on the world’s highest railway is far too exciting to warrant sleep. So here we are, four adventurers on the wiser side of middle-age, hoping for the journey of a lifetime. Collin from Scotland is a world-wide railway buff while Claire and John still muse about their honeymoon checking out steam trains in a Welsh scrapyard. As for me, I just want to add a little ‘je ne sais quoi’ to the Tibet experience. It’s fun all round and the young Chinese nurses next door join in. They’re off to Lhasa on holiday. ‘Don’t worry about altitude,’ they laugh, ‘we can do mouth to mouth.’ The men look at each other but no chance. If need be, we’ll dispatch them to the clinic, carriage n° 12. But what can you do on such a long journey? Strangely enough, there isn’t a dull moment. 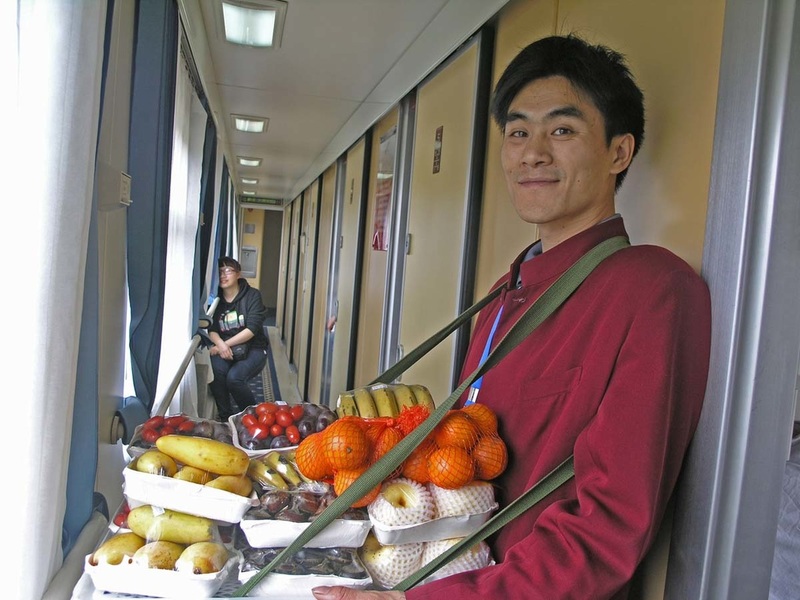 First it’s passport control, then the fruit seller walking up and down the corridor, the piped music, the female guard keeping an eye on things, the height chart used to check the children’s fares, the electronic display in Mandarin, Tibetan and English, recording altitude and ‘velocity’, maximum 160 km/hr though we rarely reach that. Every carriage is pressurised like an aircraft cabin, windows sealed but there are panoramic views and flip up seats in the corridor to enjoy the view. Mountains and gorges loom through the mist, green plastic sheets cover much of the valley floor and ghost-like villages pop straight out of the earth. 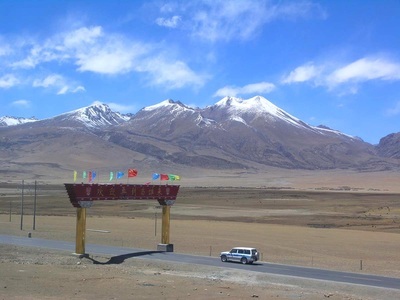 Pasang talks about a Chinese princess who did the journey on horseback in the 7th century to marry the Tibetan Emperor. According to legend, it took her seven years. The lunch trolley arrives around 11-30, not too inspiring so we opt for the dining car with purple curtains, à la carte and waiter service. Scrambled egg and tomato, pork with edible fungi and boiled rice, we rise to the challenge, chopsticks and all, watched by our bemused fellow diners, Tibetans and Chinese alike. But suddenly the train stops, right in the middle of a tunnel, then out of nowhere comes a column of little men and women, wrapped up from head to toes, marching along the track with shovels on their shoulders. They look like the Seven Dwarfs heading home in the dark but fix the problem in no time at all. The guide book mentions countless tunnels, including the world’s highest, Fenghuoshan, at 4905 metres, 681 bridges, 1966 culverts and 550 kms of track built on permafrost, quite an engineering feat but not without controversy. Back in 2006, the Chinese opened the line with immense pride but others saw it as a move towards further developments and a threat to the wildlife, hopefully kept under control by animal corridors and fences. Six years on, the Qinghai-Tibet railway is here to stay, linking Lhasa to Xining and a growing number of cities across China. By 6.00pm, the altitude reads 2961 metres as we reach the first prayer flags and snow-capped mountains in the distance. It isn’t Tibet yet but we can feel it. Time to celebrate and enjoy the goodies brought by our guide, peanuts, sweets, biscuits, golden raisins, instant coffee. Due to the pressure, we have to pop the bags like balloons and feel like kids on a school outing. We munch our way past salt lakes and dunes, sheep, horses and the graves of workers who died building the line. By 9.00 pm, we are asleep, cocooned in duvets, door locked, trusting the earthquake monitors will do their job when we approach the Kunlun mountains. 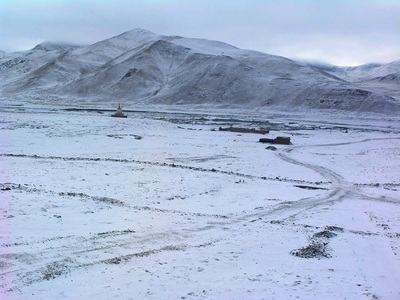 All is well and we wake up to a thick layer of snow across the plateau where Himalayan antelopes and black hairy yaks look as frozen as the landscape. We have pot noodles for breakfast, switch engines for the second time, now twin diesels, and the snow recedes to reveal mineral-rich slopes glowing red, ochre and gold above frozen rivers. 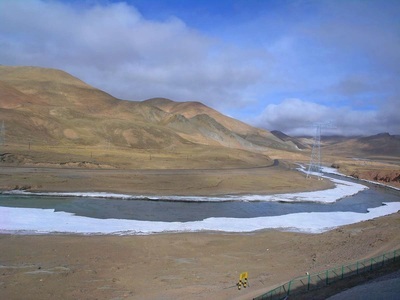 At 5072 metres, the Tanggula pass marks the highest point on the line and the invisible Tibetan border where a man stands to attention as we pass but the train doesn’t stop. 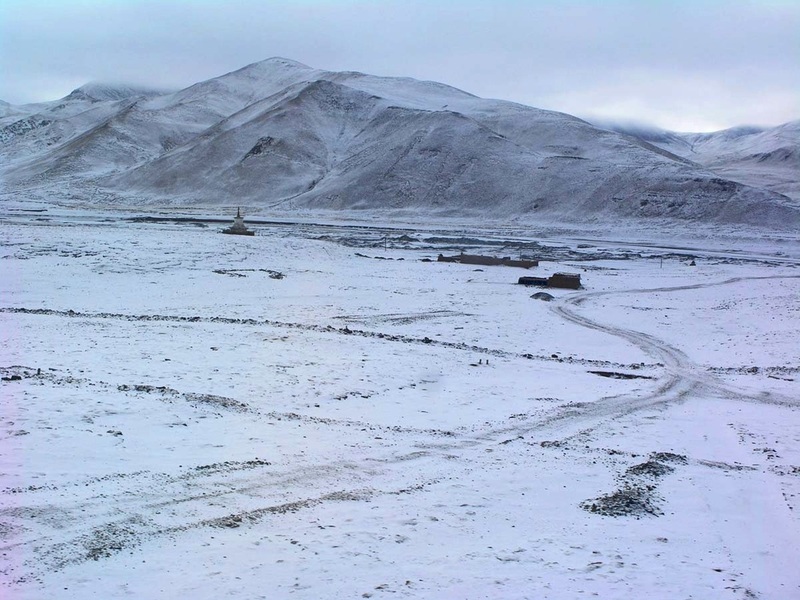 Amdo is our first Tibetan station, one of barely half a dozen calls on our 2861 km journey, and as usual, we are only allowed a couple of minutes on the cold deserted platform. Later, we cross the Kekexili grasslands and skirt the Nachu Lake, glistening all shades of blue as far as we can see. 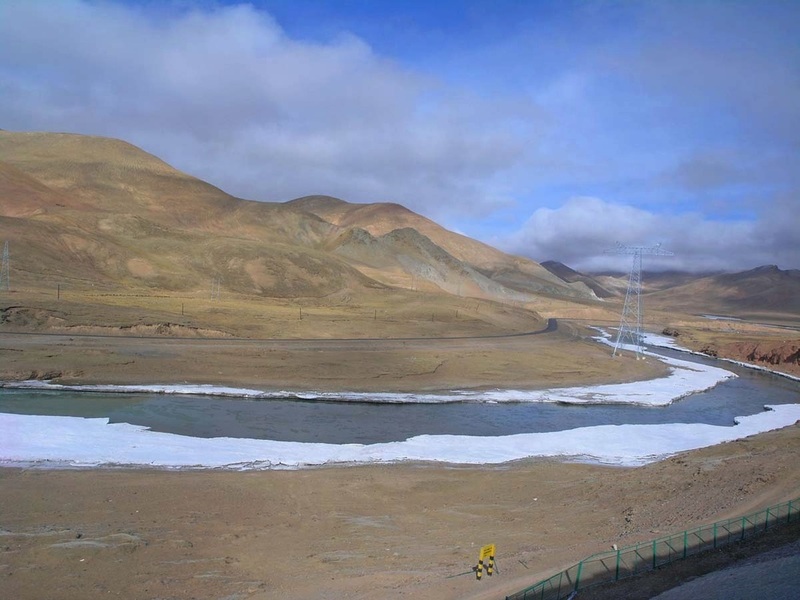 Wild geese fly overhead, nomad tents flap in the wind and brand new electric pylons glint across the wilderness on their way to Lhasa. A sandstorm dies down as fast as it rose and we follow a near empty road, lined with dummy policemen. There are no scrambled eggs for lunch, too high to cook, we are told, but there is wine from the Great Wall of China. Wine, altitude? It’s a long lazy afternoon then all of a sudden, a flutter of excitement passes through the train. 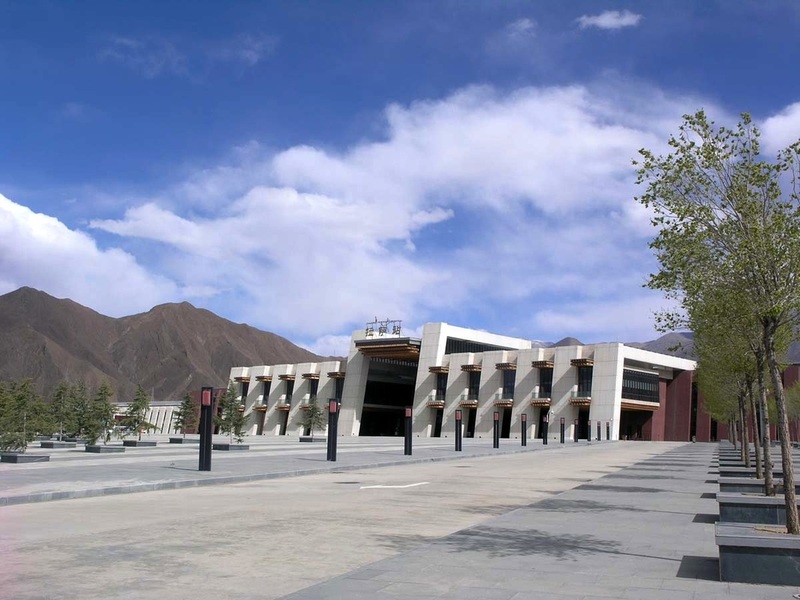 There are willows and poplars along the river, green patches of land and at last the triple-arched bridge, the greatest achievement of all, marking the entrance to Lhasa. Back in Xian, we had boarded the train at 6.44 am on Wednesday, this is now Thursday, 16.44. 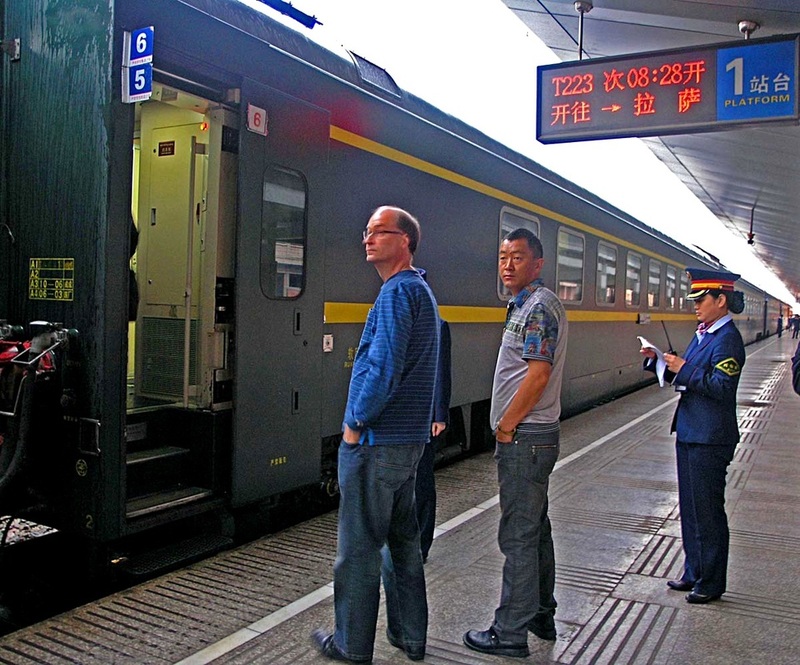 The world's highest train is on time.